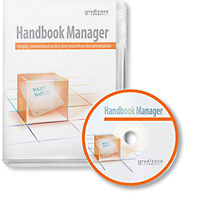 Create an employee handbook that includes all the required state and federal regulations for your business with Gradience employee manual software. Start with a basic employee manual template, and the software will recommend relevant legal guidelines. Then just customize to add your company policies, and print.